The Net Promoter Score measures customer feedback to create a numeric value representing brand loyalty. Difficult to achieve, a top NPS score means a company is held in high regard by clients and usually indicates a strong commitment to customer satisfaction and proactive, solution-focused service. NPS measures customer satisfaction based on a 200-point scale ranging between -100 and +100, with scores over 50 considered “best in class.” Service Objects has maintained its outstanding rating for the past five years because of its continued commitment to 24/7/365 support, 99.999% server uptime, experience in validating over 3 billion contact records, and in-depth knowledge of the contact validation industry. In 2014, Service Objects launched its Customer Success Program with the goal of establishing a set of benchmarks and strategies designed to make sure clients get answers quickly and maximize their investment. Featuring intensive customer support, the Customer Success Program allows customers to become acquainted with their services and get up and running quickly. From assigning a dedicated Customer Success Specialist to scheduling regular check-ins and initiating proactive monitoring and analysis of every account, Service Objects can ensure maximum uptime while also providing fast and responsive service. From day one, customers have access to ongoing customer support that includes quarterly check-ins, 24/7/365 emergency response, courtesy testing keys, and more. Service Objects continually measures its NPS score to gain a better understanding of the current level of satisfaction amongst its client base. With a 2018 NPS score of 65, the company has achieved a score higher than the industry average of 58. This latest NPS ranking once again places Service Objects in the top tier of the technology industry, above other well-known companies including Intel (52), Cisco (38), and Spotify (24). While some organizations still have a break/fix mentality about customer support, the very best organizations now view their customer contact operations as the strategic voice of the customer – and leverage customer engagement as a strategic asset. Thanks to tools ranging from CRM and social media, many businesses manage their customer experience as closely as they manage their products and services. This leads us to an important analogy about data quality. Like the “complaint department” days of customer service, many organizations still view data quality as little more than catching and fixing bad contact data. In reality, our experience with a base of nearly 2500 customers has taught that data quality plays a very strategic role in areas like cost control, marketing reach, and brand reputation in the marketplace. This worldview is still evolving slowly. For example, according to a 2017 CIO survey by Talend, data quality and data governance remain the biggest concerns of IT departments, at 33 and 37 percent respectively – and yet their top priorities reflect more trendy objectives such as big data and real-time analytics. And back in 2012 Forrester vice president Kate Leggett observed that data quality often remains the domain of the IT department, and data projects for customer service rarely get funded. Meanwhile, data quality has also become an important component of customer experience. Leggett notes that instead of an IT-driven process of “cleaning dirty customer data,” organizations should reframe the conversation towards the impact of data quality on customer-facing functions, and understand the connection between investments in data quality and customer service metrics. When you have good data integrated with effective CRM, you have the ability to market appropriately and serve customers responsively. You can target your messages to the right people, react responsively in real time to customer needs, and create systems that satisfy and delight the people you serve. Mis-deliver a package because of a bad address, and you make a customer very unhappy. Do things like this even a small percentage of the time, and you gain a reputation as a company that doesn’t execute. Keep doing it and even many customers who haven’t been wronged yet will seek other options where possible, because of the “herd mentality” that builds around those who do complain publicly and on social media. Your customer data is an important asset that gives you the ability to analyze numerous aspects of your customer relationships and react appropriately. It holds the knowledge of everything from demographics to purchasing patterns, as well as their direct feedback through service and support. Having accurate customer data is central to leveraging this data strategically. One heartening trend is that more organizations than ever now see the connection between data quality and their customer relationships. For example, one 2017 article in PharmExec.com cited a European customer data survey showing that nearly three-quarters of life sciences respondents feel that having a complete and real-time view of customers is a top priority – while only 40% are satisfied with how well they are doing this. We are seeing similar figures across other industries nowadays, and view this as a good sign that we are moving over time towards a smoother, more data-driven relationship between organizations and their customers. There is an undeniable link between employee experience and customer experience. Companies that lead in customer experience have 60% more engaged employees, and study after study has shown that investing in employee experience impacts the customer experience and can generate a high ROI for the company. Here are 10 companies that have seen the benefit of engaging their employees to build customer experience. The article above was first published on Forbes.com and reprinted with permission. View original post here. About the author: Blake Morgan is a customer experience futurist, author of More Is More, and keynote speaker. You can read more of Blake’s articles by visiting her website. Every year, February 14th is a time when our thoughts turn to things like true love, flowers, chocolates … and data quality. In fact, there is more in common between these things than you might think. If you look at the history of Valentine’s Day, St. Valentine’s intention was to protect his fellow man. In ancient Rome, St. Valentine accomplished this by secretly marrying couples so that the husbands would not have to go to war. This is how his name became synonymous with love and marriage. Along those lines, Service Objects tries to also help our fellow man– admittedly less romantically – by ensuring your data accuracy, automating regulatory compliance, and protecting you from fraud. High quality contact data. When you communicate with your prospects or customers, the cost directly links to the accuracy and validity of your contact list. When you automate the quality of this contact data – often your biggest and most valuable data asset – the ROI will warm the hearts of the toughest CFOs. 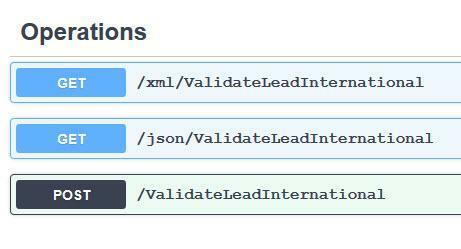 Lead validation. Does she love me or does she not? Better to find out early in the relationship whether she gave you a fake email address, bad contact information, or is otherwise giving you the slip, with validation tools that check over 130 data points to give you a numerical rating of lead quality. Delivery accuracy. Nothing will make your customers fall out of love with you quicker than misdirected deliveries – even though in the US alone, 40 million of them don’t help matters by changing their addresses every year, while many others mistype their address at the time they order. When you automatically verify these addresses against continually updated postal databases, you help ensure a good relationship. Compliance strategies. When government regulators come calling, they aren’t bringing you flowers. New rules on consumer privacy in the US and Europe have changed the game of outbound marketing, including stiff financial penalties for non-compliance, and sales tax policies are constantly changing. Automated compliance verification tools can help prevent problems from happening in the first place, and also provide quantifiable proof of your efforts. Fraud prevention. Cupid isn’t the only one aiming his arrows at you. Fraudsters are constantly trying to separate you from your inventory and money, particularly during your busiest periods. We can help with solutions ranging from address, BIN, email and IP validation to tools that provide you an overall order quality score, to help keep the bad guys out. Finally, it turns out we have one other connection to St. Valentine. In Italy, he is still commemorated by a charm known as St. Valentine’s Key, which is supposed to unlock the hearts of lovers. We have a key for you as well: a free trial key to any of our API products, yours for the asking. Happy Valentine’s Day! Many developers come to Service Objects because they recognize their company has a need for a data quality solution. Maybe you were tasked by a manager to help find a solution, perhaps someone in Marketing mentioned one of their pain points, or maybe you just naturally saw opportunities for improvement. Whatever the reason was that got you looking for a data quality solution, you most likely need to get someone in management to sign off on your solution. Often, especially in larger organizations, this can be a challenge. So how are others accomplishing this? Service Objects has been in business for over 16 years and in that time frame, we have helped potential customers just like you get sign off for our services. In addition to being armed with information from your Account Executive on how you can achieve ROI for the service you have chosen, the following recommendations are the ones we have found to be the most useful. If you haven’t already, get a free trial key for the service you are interested in. We allow you to try out as many of our 23 data quality solutions as you would like. My blog, Taking Service Objects for a Test Drive, can help you figure out which method of testing our services is best for you. One of the values in testing our services is that it reinforces your own understanding of our products. Testing allows you to quickly visualize and show others in your organization the benefits of utilizing a data quality solution. Showing your boss an actual test integration you did with our API is more powerful than just explaining how it works. Or, if you decide to run a test batch with us, you will see first hand how we can improve your contact data. You can also leverage our quick look up page and set up on a screen share with a larger team and run live examples for them. Let your team choose some data to run live and see the results first hand. Data summaries are a great visual aid to take a look at how our services help. Take a subset of any of your data sets and send them over for a batch test. Each batch test contains a comprehensive summary, providing you with how we validated your data and what the results mean. Your Account Executive can review this and guide you through the results. Having a detailed report that clearly shows the current state of your data is a great tool to have when you are ready to go forward with any type of presentation to your team. A recent blog shows what one of our reports includes. All data has a story, and with our batch summaries we try to tell that story. Having an integration plan is an asset when getting sign off for our services. You are bound to get some questions after showing your plan, such as “who?” “how?” and “how long?”. It is a good idea to be prepared to answer these questions. Integrating with us is not a complicated task and we have several resources to guide you. Our sample code can quickly get you up and running and we can even customize it for your specific use case. We also have best practices available to help you with your integration. For instance, you may need to check if there are any network or firewall issues your IT team needs to complete. If you are switching from another solution or vendor, you may need to have your integration timeline in sync with turning off an old service and turning our service on. And never forget about testing, which is one of the most important parts of any integration. Finally, you may need to account for any training you want to provide to your team about how to work with our data or your new system. Having answers to these questions can help arm you with everything you need to keep the ball rolling. Support. It is just one word but it is key. Sometimes even the most important word. You can purchase a top-notch product or service, but if you can’t get adequate customer support when you need it, your purchase loses most of its value to you. With Service Objects, this is never the case. In fact, customer service is one of our core values. We care about your success and truly want you to be succeed. If you want to get buy in from your team, then it is very important to discuss our customer service expertise. Having a dedicated customer support resource, comprised of engineers, will ease your transition to our offerings and in the end, will save your organization significant time and money. At Service Objects, our value proposition is very clear. Our data quality solutions ensure your data is as genuine, accurate and up-to-date as it can possibly be. A large percentage of our customers have been with us for many years, and this is due to the effort we put into the quality, accuracy, speed, reliability and expertise we deliver. It is always helpful to get people on your side when you want to present a new service to your company. Talking it over with colleagues and managers is great and many of the things written in this blog can help get them on your side to support your idea. It also goes a long way in educating your team on the data quality issues you are facing and how a Service Objects’ solution can alleviate many of those problems. I hope some of these ideas or tips can help you along the way in presenting our services to your team or manager. The last thing you want to do is have a conversation with your boss without adequate preparation. Your ideas are good, so take your time and plan the right action in getting them implemented. In the end, the results our services will provide for your company will be impactful and worth your time. Visit our product page to Get started testing any of our services. In today’s fast-paced world, customers have become more demanding than ever before. Customer-centric organizations need to build their models after critically analyzing their customers, and this requires them to be data-centric. Today, customers expect companies to be available 24/7 to solve their queries. They expect companies to provide them with seamless information about their products and services. Not getting such features can have a serious impact on their buying decision. Customer-centric organizations need to adopt a data-centric approach not just for targeted customer interactions, but also to survive competition from peers who are data-centric. Today, customers enquire a lot before making a decision. And social media enquiries are the most widely used by customers. A satisfactory experience is not limited to prompt answers to customer queries alone. Customers need a good experience before making the purchase, during the installment of product or deployment of service, and even after making the purchase. Thus, to retain a customer’s loyalty and to drive in regular profits, companies need to be customer-centric. And that can only happen if companies adopt a data-centric approach. Big data comes handy in developing a model that gives optimum customer experience. It helps build a profound understanding of the customer, such as what they like and value the most and the customer lifetime value to the company. Besides, every department in a data-centric organization can have the same view about its customer, which guarantees efficient customer interactions. Companies like Amazon and Zappos are the best examples of customer-centric organizations that heavily depend on data to provide a unique experience to their customers. This has clearly helped them come a long way. Keep a close eye on any kind of new data that could help them stay competitive, such as their product prices and the money they invest in logistics and in-product promotion. They need to constantly monitor the data that tells them about the drivers of these income sources. Reach out to customers from different fields with varying skill sets to derive as many insights as possible so as to help make a better product. Develop a full-scale data project that will help them collect data and apply it to make a good data strategy and develop a successful business case. Today, there is no escaping customer expectations. Companies need to satisfy customers for repeat business. Customer satisfaction is the backbone of selling products and services, maintaining a steady flow of revenue, and for the certainty of business. And for all of that to happen, companies need to gather and democratize as much information about their customers as possible. Reprinted with permission from the author. View original post here. There are a lot of buzzwords thrown around in the customer sphere, but two of the big ones relate to experiences—customer and user. Although CX and UX are different and unique, they must work together for a company to have success. User experience deals with customers’ interaction with a product, website, or app. It is measured in things like abandonment rate, error rate, and clicks to completion. Essentially, if a product or technology is difficult to use or navigate, it has a poor user experience. Customer experience on the other hand focuses on the general experience a customer has with a company. It tends to exist higher in the clouds and can involve a number of interactions. It is measured by net promoter score, customer loyalty, and customer satisfaction. Both customer experience and user experience are incredibly important and can’t truly exist and thrive without each other. If a website or mobile app has a bad layout and is cumbersome to navigate, it will be difficult for customers to find what they need and can lead to frustration. If customers can’t easily open the mobile app from an email on their phone, they likely won’t purchase your product. Likewise, if the product layout is clunky, customers likely won’t recommend it to a friend no matter how innovative it is. User experience is a huge part of customer experience and needs to play a major role when thinking like a customer. Although UX and CX are different, they need to work closely together to truly be successful. Customer experience representatives should be working alongside product engineers to make sure everything works together. By taking themselves through the entire customer journey, they can see how each role plays into a customer’s overall satisfaction with the product and the company. The ultimate goal is a website or product that beautifully meshes the required elements of navigation and ease with the extra features that will help the brand stand out with customers. When thinking about customer experience, user experience definitely shouldn’t be left behind. Make both unique features an essential part of your customer plan to build a brand that customers love all around. Author Bio: Blake Morgan is a customer experience futurist, author of More Is More, and keynote speaker. Go farther and create knock your socks-off customer experiences in your organization by enrolling in her new Customer Experience School. Thanksgiving in the United States is about much more than taking a couple of days off from work, eating too much turkey, or starting your holiday shopping. This holiday has always had a higher purpose: to reflect and give thanks every year. So what am I thankful for? There are three things on my list. First and foremost, I am thankful for you, our customers. Obviously every CEO is thankful for paying customers, but I also mean it from a different perspective: you are a very diverse and talented group of people, and we enjoy working with you. Our customers run the whole gamut of applications: increasing museum attendance through demographic analysis, creating precise address lists to expand rural broadband coverage, geocoding maps of hurricane refugees, and much more. It is truly never boring to come to work here. Which leads me to the next thing on my list: I am thankful that Service Objects is a great place to work. We began as a small startup in 2001, but today we are a growing organization whose management team has over a century of combined experience in our respective fields. And we hire really cool people! We have a strong culture that emphasizes teamwork, healthy living and environmental awareness. And who wouldn’t be thankful for coming to work in sunny Santa Barbara, California every morning? More important, everyone here is extremely good at what they do, whether it is technology, service, or operations. We operate in a very competitive space, and quite frankly the talent of our people – and the clear service culture people experience when they work with us – is our biggest competitive differentiator. If you look at the many customer success stories on our website, you will find clients raving about our technology AND our people, and I am very proud of that. Finally, one of the biggest things I am thankful for is the chance to make a real difference in the environment we share on this planet. Many people know that I first started this company in response to the problem of excessive junk mail in the waste stream, developing mathematical models for ways to mitigate this massive waste of resources. Our focus on real-time contact validation, and all the products and services that follow from there always has had its roots in resource conservation. Today, we are proud to have processed nearly three billion transactions. This translates directly to less waste and more efficient use of our precious resources, saving 23 million gallons of water and 11 thousand cubic yards of landfill space each and every year. Since Service Objects’ inception in 2001 this adds up to 12 million trees and 150 million pounds of paper saved – and counting. This is a legacy we frankly cherish as much as any quarterly sales figures. Hope you have a very happy Thanksgiving holiday! Service Objects is committed to constantly improving the experience our clients and prospective clients have with our data quality solutions. This desire to ensure a great experience has led us to revamp and redesign our lookup pages. These pages are easy to use and give all the information necessary for integrating and using our API in your application. This blog presents some of the key features. One request we often receive is a quick sample lookup that will show our customers and prospects what to expect when calling our API. We are implementing just that in our new lookup pages. We implemented this option so that users can get a quick idea of what types of inputs our services accept and what type of outputs the service will return. The form simply needs a license or trial key and it will return the validated data. Another benefit of these new pages is that they concisely and easily display all the methods available for an API along with all the potential HTTP methods that can be used to interact with the service. If you want a JSON or XML response, select the appropriate GET operation and you will have everything you need to make a successful request to the service. If you want to make a POST request to the service, simply select the post operation and it will detail all that you need to have your data validated in your method of choice. Arguably the most important pieces for a developer looking to integrate with an API would be to know how to make a request to the service, and what type of response to expect. These new lookup pages provide that information in a very easy way as shown below. After making a sample request, you will see the URL used to fetch the validated data, the actual response from the web service, and the response headers that the service provides. These are all vital pieces of information that will have you up and running in no time. The new pages also list what type of response object will be returned from the service. This can be seen below the response body and headers. The page also offers up extra pieces of information that will assist with integration. The link to our developer guides, WSDL (for SOAP integrations) and host paths can be found on the page as well. These resources will help you have your application up and running as quickly as possible. Feel free to sign up for a Service Objects trial key to test with our new look up pages! So many reports focus on spitting out data that they often overlook the importance of being able to quickly digest the information and present a clear action plan. At Service Objects, we want you spending your valuable time acting on the results – not trying to make a report readable and understandable. As a result, we have invested considerable resources into ensuring our Batch Summary reports – the ones we provide you after we run your list – not only look great, but are immediately accessible and actionable. Your account executive will review the results of the report with you and answer any questions you may have, but you will also have a link to the detailed report for your reference and to share with your team members. So how we did we improve the reports? We focused on telling your business’ data story and showing how our services can help improve your data accuracy. We have started with a few services and operations, and in the coming months, we will continue to roll out more of them out as they are ready. Some of the ways we tell the story better is presenting easy to understand charts and data breakdowns so that you can focus on the parts of your data that you are most interested in. 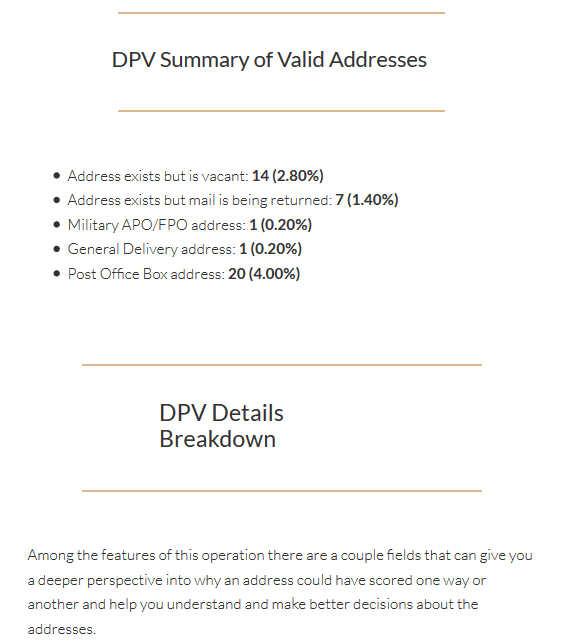 The following link provides a sample of our DOTS Address Validation US – 3 batch summary report and I have detailed out the features of the report below. The summary starts with a brief description of the service and operation followed by a section where we define the main output of the service. In this case, the report is focused on Delivery Point Validation or DPV. We show how the DPV results break down across the varying DPV notes, corrections and Is Residential data points. So, at a glance, it is easy to decipher the balance between the various DPV values. Throughout each report, when we see interesting data points, we shine a spotlight on them and add additional custom content to help highlight them. 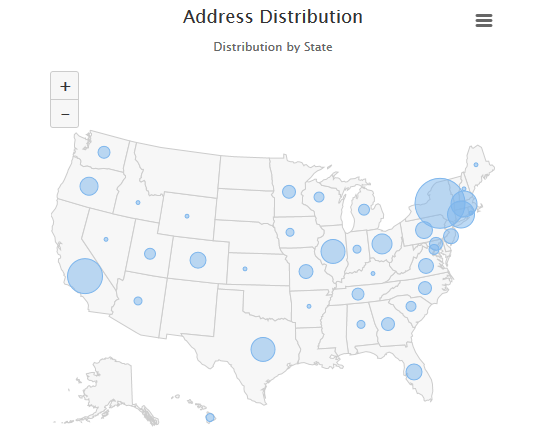 The report also drills down on the geographic nature of the data, showing how your list of addresses are distributed across each state and the country. The values are plotted on a map to provide a strong visual representation and hovering over a particular location also displays the underlying values. Included in this location distribution, is how the DPV values correlate to a location, where we overlay the pie chart breakdown of the actual DPV values. The break downs are by county and congressional district so your analysis can be completed very quickly. Clicking on the three bars in the top right of any chart or graph will allow you to either save or print that particular chart. These new batch reports will also allow you to view your details from anywhere, on any screen size. No need to mess with PDF or specific file types, you just need an internet connection and a link to the report. Lastly, we take data security very seriously. The reports are all provided very securely, so no one can see anyone else’s reports and data is never shared. Our hope is to provide a clearer understanding of your data, making it fast to digest and act on. If you have any questions or would like to us to run a sample data set for you, please contact sales@serviceobjects.com. Service Objects, Inc. is fanatical about customer support, we love working with clients and prospects to build the kind of APIs that they want and need. Some of our best ideas come from listening to our clients and prospects, discussing their problems and figuring out how we could help solve them. Often, we do quite a bit of tailoring and will develop new features to help solve some of their challenging problems. 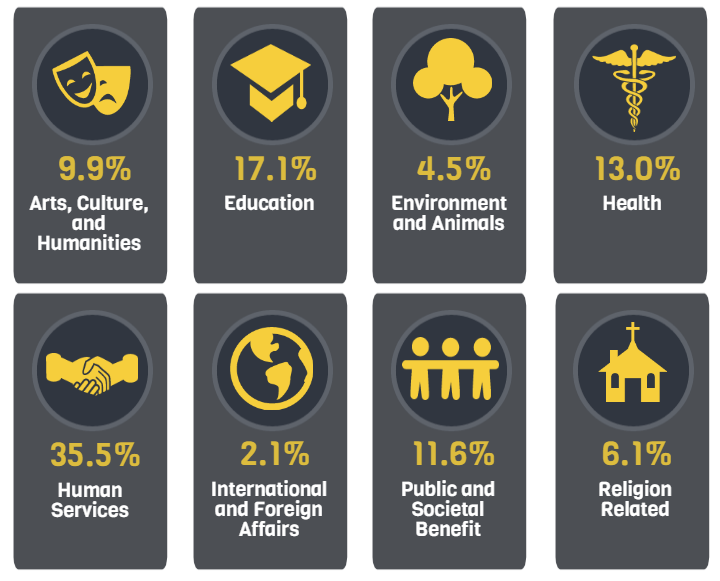 One of the recent additions to the Service Objects’ library is identifying nonprofit organizations, also known as not-for-profit, or Tax Exempt organizations within our DOTS Lead Validation service. Why is it important to know if an organization is a nonprofit? Nonprofits follow different rules than most organizations and a company’s interaction with a nonprofit may be completely different than it would be with a for-profit company. Knowing that you are engaging with a nonprofit beforehand allows you to be better prepared and make informed decisions moving forward. As an example, we recently worked with one of our clients to enhance our Lead Validation service to identify non-profits in their prospect database. This helps them determine the viability of the customer, their ability to transact large purchases, as well as the pricing they can offer. In some cases, nonprofits may not need to pay sales tax on goods, which could be a factor in determining how much to charge them. These are just a couple of examples of the value of knowing the type of organization you are working with. What is a nonprofit and how do we identify them? For Service Objects, there are multiple ways we identify a company as a nonprofit, including by Tax number (EIN), address or location, business name and/or a combination of the above. We continue to develop and improve this feature of our Lead Validation service and are happy to make it available to all of our customers. At Service Objects, we are committed to meeting the needs of all our customers. It is just a little more rewarding when we can contribute to doing good as well. List processing is one of the many options Service Objects offers for validating your data. This option is ideal for validating large sets of existing data when you’d rather not set up an API call or would simply prefer us to process the data quickly and securely. There is good reason to have us process your list: we have high standards for security and will treat a file with the utmost care. As part of our list processing service, we offer PGP encryption for files, SFTP file transfers, and encryption to keep your data private and secure. We also have internal applications that allow us to process large lists of data quickly and easily. We have processed lists ranging from tens of thousands of records to upwards of 15 million records. Simply put, we consider ourselves experts at processing lists, and we’ll help ensure that your data gets the best possible return available from our services. That said, a few steps can help guarantee that your data is processed efficiently. For the best list processing experience – and the best data available, we recommend following these best practices for list processing. Processing international data – If you have a list of international data that needs to be processed, make sure the file has the right encoding. For example, if the original set of data is in an Excel spreadsheet, converting it to a CSV format can destroy foreign characters that may be in your file. 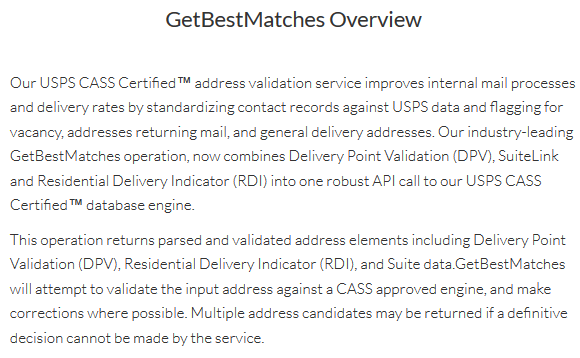 When processing a list of US addresses, this may not be an issue but if you are processing an International set of addresses through our DOTS Address Validation International service, then something like this could highly impact your file. One workaround is to save the file as Unicode text through Excel and then set the encoding to UTF-8 with BOM through a text editor. Another option is to send us the Excel file with the foreign characters preserved and we will convert it to CSV with the proper encoding. Preventing commas from creating unwanted columns – Encapsulating a field containing commas inside quotation marks will prevent any stray commas from offsetting the columns in your CSV file. This ensures that the right data is processed when our applications parse through the CSV file. When processing a list with multiple millions of records, breaking the file into multiple files of about 1 million records each helps our system more easily process the list while also allowing for a faster review of the results. Including a unique ID for each of the records in your list helps when updating your business application with the validated data. Matching your input data to ours can speed up list processing time. For example, some lists parse address line 1 data into separate fields (i.e., 123 N Main St W would have separate columns for 123, N, Main, St, and W). DOTS Address Validation 3 currently has inputs for BusinessName, Address1, Address2, City, State and Zip. While we can certainly manipulate the data as needed, preformatting the data for our validation service can improve both list processing time and the turnaround time for updating your system with freshly validated data. These best practices will help ensure a fast and smooth list processing experience. If you have a file you need cleansed, validated or enhanced, feel free to upload it here. For businesses engaged in commerce, it is a real challenge to stay on top of ever changing sales and use tax rates. One minor tax rate change can have a direct impact on your customers, costing your business significant time, money and resources. In addition, the complexity of tax laws continue to increase every year, with constant changes in tax rates, and tax jurisdictions that often go beyond simple measures such as ZIP codes or municipality. And the risks to businesses for non-compliance are potentially severe. The result from charging customers the wrong rate can have a significant impact on a business. Unhappy customers cause customer service issues, can have a negative impact on employee morale and have a substantial financial impact from processing refunds or collecting outstanding money owed. All this means that maintaining tax compliance – particularly in today’s business environment, with everything from multiple distribution channels to e-commerce – requires planning and processes to become a smooth-running, cost effective part of your business. You’ve found Service Objects, you’ve read about our services so now you want to test drive. Well, there are several ways to do just that and as I go through the options you will also get a pretty good picture about how you can integrate our services into your applications or processes. Testing can be a tedious task, delving into the unknown of a third party process, but we make it easy for you to jump right in by giving you several ways to test such as our Quick Lookup Tool, DataTumbler, Batch Processing and our real-time API services. The Quick Lookup tool is used to test one off examples on our website. It is as simple as navigating to the Quick Lookup page, selecting the particular service you are interested in, filling out the fields and clicking submit. You’ll receive a real time response from the service containing the results of your test. Since our services often offer multiple operations the Quick Lookup pages will inform you which operation is being used for the particular service in the form. If there are other operations you are interested in testing then we have you covered there as well with links to the other operations. The DataTumbler is a PC-based desktop application you can download from our site to run tests on multiple records. If you have ever used Excel then this application will be easy for you to drive. It works like a spreadsheet where you can paste multiple records for processing, in real-time. Here are the basic steps: Choose your service, choose your operation, drop your data in and click validate. Choosing the service and desired operation is important because often it will change the input columns needed for the records to process properly. In the screenshot above you can see that there are 5 input columns designated by the yellowish cell background. Here we have inputs for Address, Address2, City, State and Zip. If your particular purposes do not require Address2, for instance, then that column can be removed by simply clicking on the “Customize Input Columns” button and removing it from the input. You can do the same thing for the output columns as well but in that case you would need to access the “Customize Output Columns” popup. The output columns are designated by the cells with the greenish background. You can also add additional columns that are not predefined by the application by right clicking a column and selecting “Insert Column”. This is handy for situations where you want additional data to stay together with your test like a unique identifier or other data unrelated to testing the service. Once one of the validation buttons at the bottom is pressed, the DataTumbler will make requests to our services in real-time and populate the output columns as the data is being processed. To get the application please call Customer Support at 1.800.694.6269 or access Live Chat and we will get you started. Batch processing is another way you can test drive our services. When you have a file ready to go for testing you can simply hand it over to us. We will process it and send back the results to you along with a summary. We can see the data you send us first hand and give you feedback about what the file looks like with respect to items like formatting. By seeing all the fields of data we can quickly recommend the most beneficial service. It gives us an opportunity to see the results with you and go over any interesting data points from a data validation/cleansing expert point of view. All that is needed for this is a test file containing the records you want to try out. The file can come in several formats including txt, csv and xls to name a few. You can send us the file directly to an email or for a more secure means we can provide you a secure ftp for the file transfer. We can also handle working with encrypted data when an extra security layer is needed. An additional way to get us your test file is through our web site itself. You can drag and drop a file and be on your way. Once we have the file we will process it against the service you are testing and return the results along with a summary breakdown of the processing. If your test run is a success and you’re ready to move forward with a larger file, we can also run one-time paid batch. Clients often use a this as an initial data scrub before a switching to our real time API or automated batch system which will run batches virtually on demand. The last way you can test our services is by implementing our API in your code. Most clients use the API when they integrate with us so testing this way gives you the closest representation of how your production process will work with our services. When it comes to doing a direct software integration test we have you covered. We make it easy to integrate and get testing quickly by means of sample code, code snippets, step-by-step integration walk-through blogs, developer guides and NuGet for Visual Studio. We have sample code for C#, Java, PHP, Rails, Python, NodeJS, VB.Net, Classic ASP, Microsoft SQL Server, APEX and Cold Fusion. This list does not mean that we stop there. Additional sample code can be requested and our team will review to find the best solution for you. When applicable, our sample code will be available in both REST and SOAP. All of our examples will implement best practices and demonstrate failover. If you are a C# developer and use Visual Studio you will have us at the hands of your finger tips. Using the NuGet Manager in Visual Studio you can have our API injected into your code and ready to go. All of our walk-through tutorial blogs and documentation are presented in a straight forward and easy to understand format and as always the Service Objects team is here to assist with any questions or help you may need. When it comes to test driving our services we give you options to make it easy. A trial key will give you access to all the options I mentioned. Going through these options also gave me a chance to show you how you can integrate with our services. The beauty behind the way we set this system up is that you can become fully integrated and tested before you even purchase a live production key. In all of these cases, usually only two things need to be updated when switching from trial testing to live production use. In the Quick Lookup Tool you will need to switch the “Select Key Type” to “Customer Production Key” and then use your live production key instead of your trial key. In the DataTumbler you will be similarly swapping those fields out as well. When it comes to doing a code integration you just need to update your endpoints from trial.serviceobjects.com to ws.serviceobjects.com and the trial key for a live production key. Whenever you want to test one or two records or a whole file, simply put, our team has you covered. 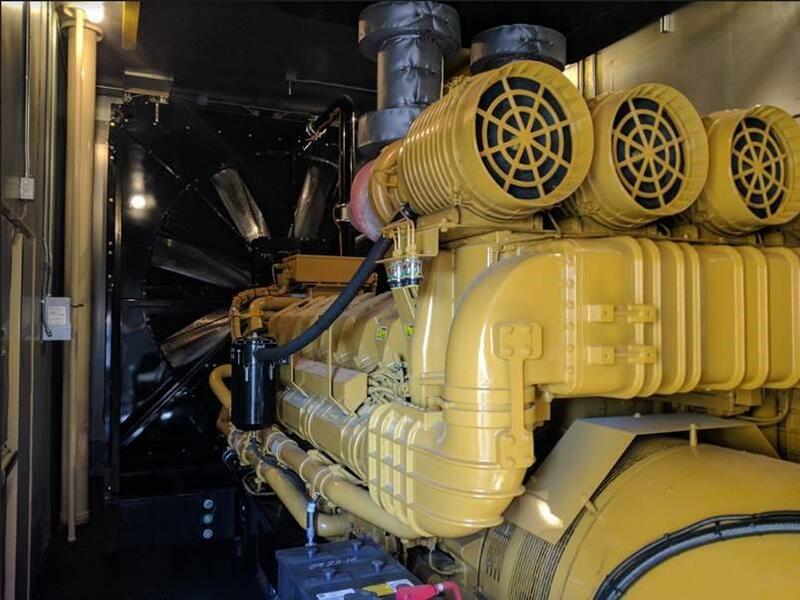 We’re excited to announce that we increased our Service Level Agreement to a 99.999% uptime guarantee, equating to less than 5 minutes of service downtime annually, or less than 26 seconds monthly! SLAs make use of the knowledge of enterprise capacity demands, peak periods, and standard usage baselines to compose the enforceable and measurable outsourcing agreement between vendor and client. As such, an effective SLA will reflect goals for greater performance and capacity; productivity; flexibility and availability; and standardization. At the same time, an SLA should set the stage for meeting or surpassing business and technology service levels, while identifying any gaps currently being experienced in the achievement of service levels. SLAs capture the business objectives and define how success will be measured, and are ideally structured to evolve with the customer’s foreseeable needs. The right approach to SLAs result in agreements that are distinguished by clear, simple language, a tight focus on business objectives, and ones that consider the dynamic nature of business to ensure evolving needs will be met. 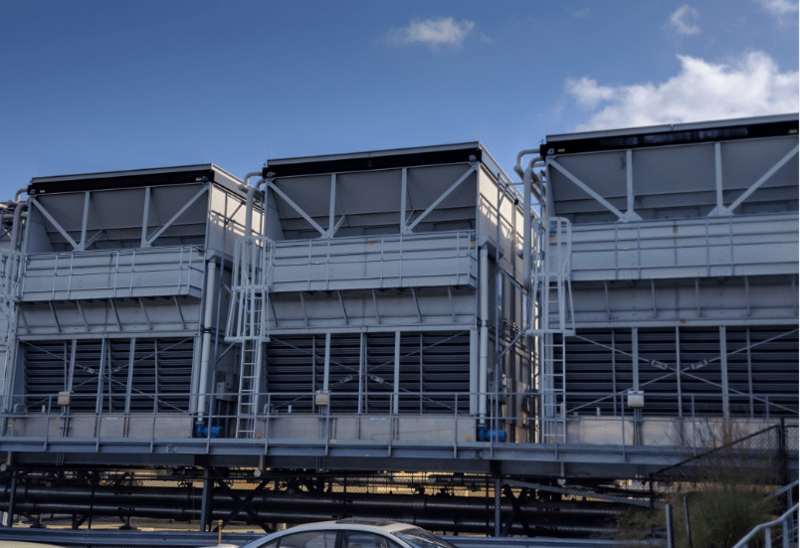 Multiple data centers provide redundancy by using redundant components, systems, subsystems, or facilities to counter inevitable failures or disruptions. Our servers operate in a virtualized environment, each utilizing multiple power supplies and redundant storage-arrays. Our firewalls and load-balancing appliances are configured in pairs, leveraging proven high-availability protocols, allowing for instantaneous fail-over. Compliance is an important benefit of professional data centers. In today’s business climate, data often falls under government or industry protection and retention regulations such as SSAE 16 standards, the Health Insurance Portability and Accountability Act, and the Payment Card Industry Data Security Standard. Compliance is challenging without dedicated staff and resources. With the third party data center model, you can take advantage of the data center’s existing compliance and audit capabilities without having to invest in technology, dedicated staff, or training. We’ve invested in “bank grade” security. Several of our data centers are guarded by five layers of security, including retinal scanners. All systems are constantly monitored and actively managed by our data center providers — both from a data security and a performance perspective. In addition, we operate our own in-house alerting and monitoring suites. Ensuring a high level of uptime comes down to: redundancy and resiliency, compliance, geographic load balancing, great data security, and 24/7 monitoring. All of these factors are equally important and contribute to our 99.999% uptime results — guaranteed! We live in an age where an overabundance of information and resources are just a few clicks away. Even physical goods can be delivered to your front door the very same day you order. People want and expect to have the similar convenience and response times when they need technical support. Us tech support experts here at Service Objects completely understand that. One of our core values is to offer outstanding Customer Support to our clients. We have a good day at the office when we can quickly and effectively answer questions about our services, resolve issues and get the data hungry masses up and running with their validation service of choice. To help ensure that our customers can get back to using their validation service for their business we have several avenues where people can seek support. Do you have a pressing issue after hours? We understand that this can be exceedingly stressful and frustrating. We want help you get it resolved as quickly as possible. If you do ever run into an after hours support issue call our office phone number (1.805.963.1700) and follow the prompts. Once directed leaved a message with a detailed description of the issue you are encountering and the best way to contact you and a member of our team will typically contact you within 20 minutes. Have a quick question that you want answered right away? Like: what URL you should be using? What does this particular response mean from the service? Is this an expected response from the service? Are there any current issues occurring with the service? Is there a different endpoint I should hit for a different operation? Questions like this are examples of ones we would be happy to answer in our LiveChat on our website. Simply navigate to our website during business hours and someone will be able to start a LiveChat with you once you are available. Once they do, simply state the question or issue you are experiencing, along with pertinent account information and we will happily assist in any way we can. The primary method to address and keep track of all our support inquiries is through our support ticketing system. Whether you call in, use LiveChat or send us an email, most technical support issues will get sent to our ticketing system and we’ll use it to quickly and effectively address any issues or questions you may have. To create a ticket, simply email support@serviceobjects.com or click here and you can fill out the form to get a ticket created. Feel free to use any of the above channels to contact us and we’ll be glad to offer any support that we can! Ruby on Rails (or more colloquially, “Rails”) is a server-side web application framework that provides its users a powerful arsenal to create web pages, web services and database structures. 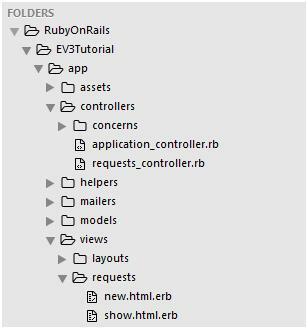 Rails utilizes a model-view-controller (or MVC for short) framework that provides an easy way to separate the user interface, database model and controller. One of Service Objects highest priorities is getting our clients up and running with our DOTS Validation web service(s) as quickly as possible. One way we do this is by providing sample code and occasionally, step by step instructions. 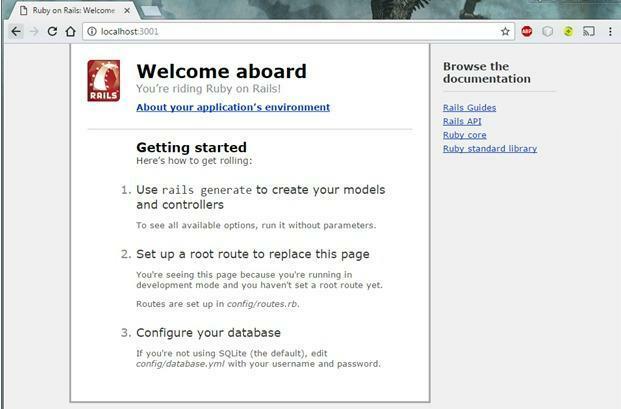 So if you are partial to using Rails, this tutorial will provide everything needed to get up and running. A DOTS license key, click here for a free trial key. 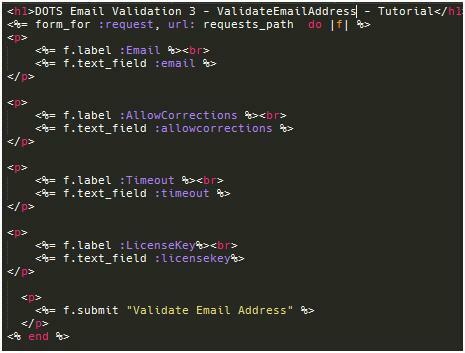 We’re using DOTS Email Validation 3 for this tutorial. Ruby On Rails installed on your test machine. First, navigate to the directory via command line in which you would like the project created. Once the command line is in the desired directory, run the command “rails new EV3Tutorial.” You may call the project whatever you prefer, but this will be the name of our tutorial. After the project creation is finished you should have a brand new Ruby on Rails project. You can launch the server by simply being in the project directory and entering “rails server” into the command line. The default port number the project runs on is 3000. We’ll be using port 3001 for this project; the port number can be specified by entering the following command to launch the server: “rails server –p 3001”. This page is the default page for any new Rails project. From here, you find more documentation about working with Rails. We’ll need a controller to make the actual call to the DOTS web service and a model to pass information to our controller. 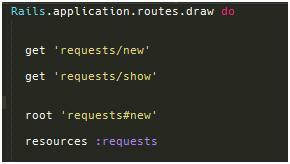 Simply type “rails generate controller request new show” and the necessary controller and views will be created. This command will also create two new views; one titled “new.html.erb” and the other called “show.html.erb”. The command line should look similar to the following. 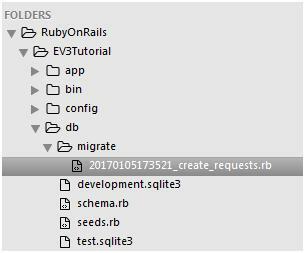 The “new.html.erb” file will be our default page, so to make the application load it automatically open the routes.rb file in the config folder of the project and make the routes page look like the following. 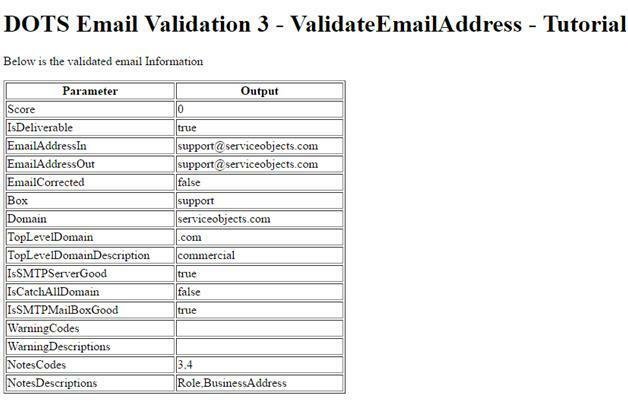 For this example, we’re using the “ValidateEmailAddress” operation which has 4 separate inputs. 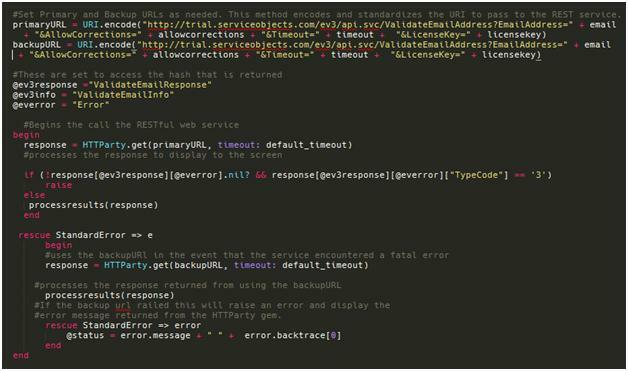 EmailAddress, AllowCorrections, Timeout, and LicenseKey. These, in turn, will be part of our model that will pass values from the view to the controller. So before we fill in the HTML page, we’ll create the model and include these values in its definition. To add values to the model, make the model schema on your file look like the following. In order to use the model, it will need to be migrated. To do this enter “rake db:migrate” into the command line to commit the model. Now that our model has been created and committed to the database, we can pass values from the view to controller. To do this, we’re going to create a simple web form with the inputs to send to the DOTS Email Validation service. 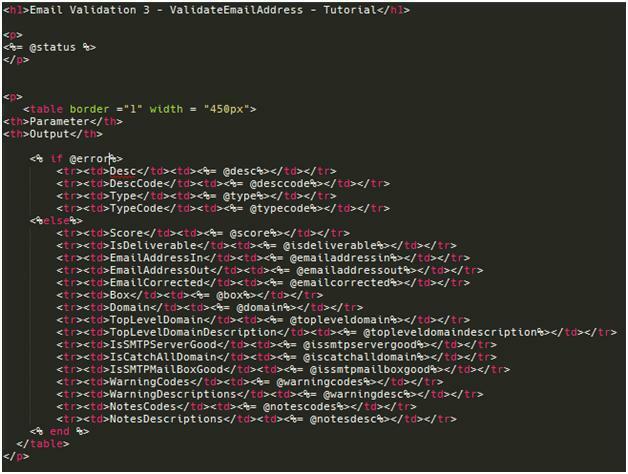 To do this, add the following code to the “new.html.erb” file. Now that our input page is set, we’ll make sure our “show.html.erb” file is ready to display some output values from the service. We will include a brief if statement in the show that will determine whether or not an error object is present in the response from the service. If one is present we’ll display that if not, we’ll display the valid results. Make your show.html.erb file look like the following. These output fields haven’t been instantiated or set to any values yet but that will happen in our controller. Now that our views are set up, we’ll need to put some code in the controller to make the actual web service call to the Service Objects web service. To make this call, we’re going to use the gem “httparty” which will allow us to make a RESTful web service call. Be sure to place this gem in your projects gem folder and run a “bundle install” in the command line. We won’t go over all the elements of the controller file in this tutorial, but rather just touch on some important parts of the logic to be integrated. The screenshot below highlights some important aspects of calling the web service. The code above has a primary and backup URL. Currently, they both point to the Service Objects trial environment. In the event that a production key is purchased, the primary URL should be set to ws.serviceobjects.com and the backup URL should be set to wsbackup.serviceobjects.com. These two URLs along with the accompanying logic that checks for a fatal error (TypeCode 3 for DOTS EV3) will ensure that your application continues to run in the event that the primary Service Objects data center is offline or experiencing issues. If you have any questions about the failover logic, please don’t hesitate to contact Service Objects and we will be glad to assist further. The code above calls an internal function, “processresults,” to display the values to the user. Here is the accompanying screenshot illustrating some of the logic of this function. Depending on what response comes back from the service, this code will display the values to the user. 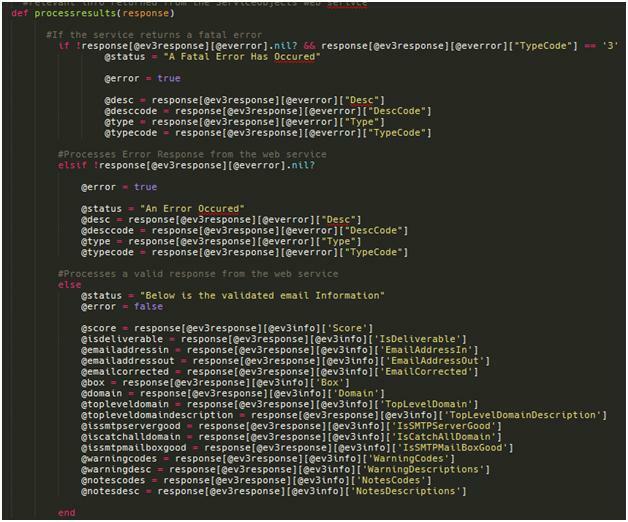 For your application, you will likely want to create a class that will automatically serialize the response from the service into something a bit easier to use; but we are showing the above logic as an example of how to parse the values from the service. Note: the @ev3response, @ev3info and @everror are present to help parse the response hash that httparty automatically creates for the response. Our project is ready to test out. For this example, we’ll use the email support@serviceobjects.com to get a valid response from the service. Entering these values in to the text boxes, along with a valid license key, should result in the following output. That completes our Ruby on Rails tutorial. If you have any questions about this, any other tutorials or sample code please don’t hesitate to contact us! We would love to help you get up and running with a Service Objects web service(s). Why focus on customer success? Retaining customers, maintaining customer loyalty, and getting new customers requires a holistic approach that goes beyond the basics of providing service, ensuring satisfaction, and resolving problems. Customers who feel engaged and heard and who have experienced a real value in doing business with you are your true success stories. Their interactions at each point have been positive, both in terms of personal interactions with your team and in using your products or services. These are the customers who will remember your brand, who will tell their friends how wonderful your company is, and who will absolutely return because the relationship and the value they receive are both so strong. 1. Commitment to customer service — Demonstrate that your company is deeply committed to customer service. While your marketing materials may tout your commitment, this is one area where actions speak louder than words. Include specific metrics – e.g. we will respond to support requests within 30 minutes, we have 24/7 support – and make sure they are adhered to and backed by a Service Level Agreement (SLA). 2. Company wide buy-in — Customer service is no longer the realm of front office staff or the support center. Get buy-in from all departments in the company so that the customer has a positive experience whether they are talking to operations, engineering, IT, sales, accounting, etc. Having a centralized CRM database is important so each department can clearly see what is being communicated to the customer. 3. Assign a single point of contact — Establish a dedicated account manager to proactively communicate product updates, important features the customer may not be effectively utilizing, and serve as the main conduit of information for the customer regarding their account. 4. Proactive monitoring — Proactively monitor the customer’s account and alert them to any unusual activity to ward off potential complaints or unexpected account usage surprises. This is a great way to cultivate a “we are looking out for you” feeling. 5. Solicit feedback — Soliciting feedback — and responding to it — shows your customers that you value their insights and are listening. Make soliciting customer feedback a regular task, and respond promptly. It’s crucial to thank them for their feedback and address concerns. Have a regularly scheduled check-in call to address any issues or concerns that may have recently come up. Before you buy a product or service from a company – particularly one you may need customer support from – be sure to do some research and find out their Net Promoter Score (NPS). NPS is a metric that captures a company’s customer feedback and provides a numeric value of its brand loyalty. A high score is not easy to achieve, so if a company has a great score, they will be letting the world know about it! NPS is calculated by soliciting feedback from customers about their experience with the company. Specifically, customers are asked the question “how likely is it that you would recommend a brand/product/service to a friend or colleague?” The answers are based on a scale from 0 – 10. Those that give a company a score of 0-6 are considered Detractors, those who give a score of 7-8 are considered Passives, and those that rate a company with a high score of 9-10 are considered Promoters. The final NPS score is calculated by deducting the percentage of customers who are Detractors from the percentage of customers who are Promoters (passives are not included in the calculation). Good Net Promoter scores vary by industry, but a score of 50 to 80 is typically considered “good”. Customers are also given the opportunity to provide feedback to the question “what is the most important reason for your score?” Companies can use this specific feedback to continue and reinforce best customer service practices, stop or improve upon procedures that are causing customer dissatisfaction, and provide employees with feedback directly from the customer.Promoters are the people companies want to go after for testimonials, while Detractors can be the ones who post negative feedback or complaints on social media channels. Proactively following up with Detractors can potentially stop a negative experience from going viral. Promoters are the people companies want to go after for testimonials, while Detractors can be the ones who post negative feedback or complaints on social media channels. Proactively following up with Detractors can potentially stop a negative experience from going viral.Capturing NPS can also serve as an eye-opener for those companies who assume that since they have not received a large number of complaints, customers are satisfied. They can often be surprised what customers are truly thinking when they are given a chance to have their voice heard. Capturing NPS can also serve as an eye-opener for those companies who assume that since they have not received a large number of complaints, customers are satisfied. They can often be surprised what customers are truly thinking when they are given a chance to have their voice heard.Relatively easy to use and deploy, companies who use NPS send existing and potential customers a signal that they are strongly committed to customer satisfaction and proactively acting on their feedback. Customers who see a company with a high NPS score know that the company is focused on customer loyalty and retention, and makes customer service a priority. Relatively easy to use and deploy, companies who use NPS send existing and potential customers a signal that they are strongly committed to customer satisfaction and proactively acting on their feedback. Customers who see a company with a high NPS score know that the company is focused on customer loyalty and retention, and makes customer service a priority. At Service Objects, one of our Core Values is “customer service above all”. We strive to achieve the highest level of customer satisfaction and regularly survey our customers for their feedback. The result of this commitment is that for the past three years, we have maintained a score 8 times higher than the technology services industry average! Our score of 64 is well above other well-known technology companies such as Oracle (21), MailChimp (20) and Constant Contact (20) and even above other customer service leaders such as Zappos.com (57), Netflix (52) and American Express (45), as rated by NPS Benchmarks. Find out more information about Service Objects’ Customer Success Program here. Many people dread the prospect of calling customer support. For starters, there could be an annoying auto-attendant feature to deal with before reaching a live agent. After pressing 1 for English, listening to a lengthy menu of choices, pressing a few more buttons, entering your account number when prompted, and waiting for what feels like an eternity to be transferred, you finally reach a customer service representative who has no idea who you are or why you may be calling. Grateful to have reached a real person, you attempt to explain your issue. The CSR can’t proceed until she has first gathered some information. She asks for your account number — you know, the one you just entered when navigating the automated system. Taking a deep breath, you find and relay your account number. She then asks you to confirm your phone number and address, so you do. Next, the CSR asks for the invoice number of the product in question. You don’t know the invoice number, all you know is that you ordered a red sweater and it never arrived. Before you know it, your call is being transferred and, once again, you’ve been asked to press 1 for English. You can bet that you’ll need to repeat the entire story and provide the new CSR with all of your contact information once again. Is This the Customer Support Experience You Want for Your Customers? The scenario above plays out countless times each day, but it doesn’t have to be this way. While data validation APIs won’t necessarily solve every problem outlined above, our contact validation APIs can help to improve your customer support operations. For example, let’s start with the original transaction. 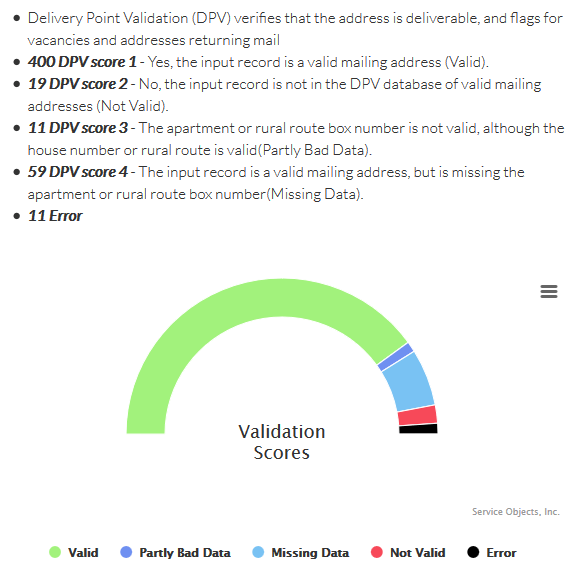 Using our address validation API can improve deliveries by immediately validating, standardizing, and correcting your customers’ addresses. Ship your products with confidence that they’re properly addressed. Next, let’s tackle that dreaded phone call to customer support. Integrating DOTS Geo Phone Plus into your telephony system allows you to perform real-time reverse phone lookups to find out exactly who’s calling and from where. If a given phone number is associated with a contact record in your software, your customer service representatives would have the customer’s account information at their fingertips without having to prompt the customer for account numbers or other information. You could also use DOTS Geo Phone Plus in conjunction with your phone system’s routing capabilities to route individual callers to specific CSRs based on the caller’s location. Improving customer support is a top priority, and improving the quality of your data plays an important role in the process. 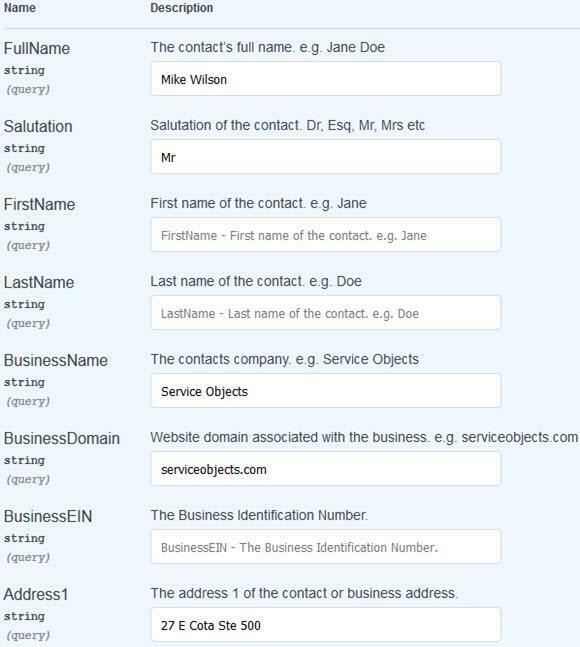 Use our contact validation APIs to instantly validate, correct, and standardize contact information. This one enhancement to your process alone can prevent common shipping delays, missing shipments, embarrassing name and addressing errors, and more. Not only will your customer support center have fewer unhappy customers to deal with, your company will operate more efficiently.